There&apos;s nothing more that needs to be said about Philadelphia sports fans that hasn&apos;t already been said. People will always find a way to hate them, no matter what. The throwing snowballs at Santa talk has been old for the past 10 years. But since this is the age of social media and instant reaction, the Internet will surely eat this clip up. 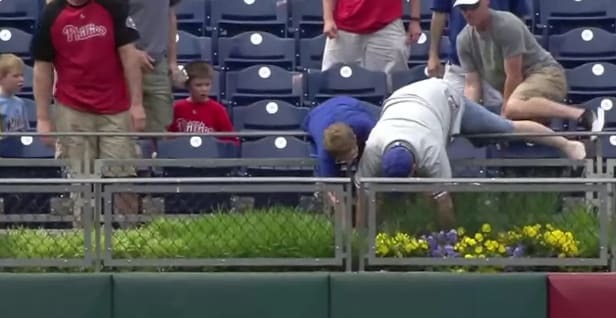 During yesterday&apos;s Phillies/Diamondback game, a Phillies fan pushed away an old lady to steal a home run ball from Maikel Franco after he hit his first major league homer. Most people will throw shade at the man for taking the ball from the lady, but that looked like fair game to me. It can&apos;t be his fault that she moved a little too slow. The Fox Sports announcers did try to fix the situation by giving the lady a T-shirt, which put a smile on her face. Maybe she didn&apos;t get the ball, but now we can truly determine that chivalry is dead. Plus, maybe the Phillies will bring this man in for a tryout. He looks more aggressive than Ryan Howard has been this season. So, was the man right in grabbing the ball from the old lady?